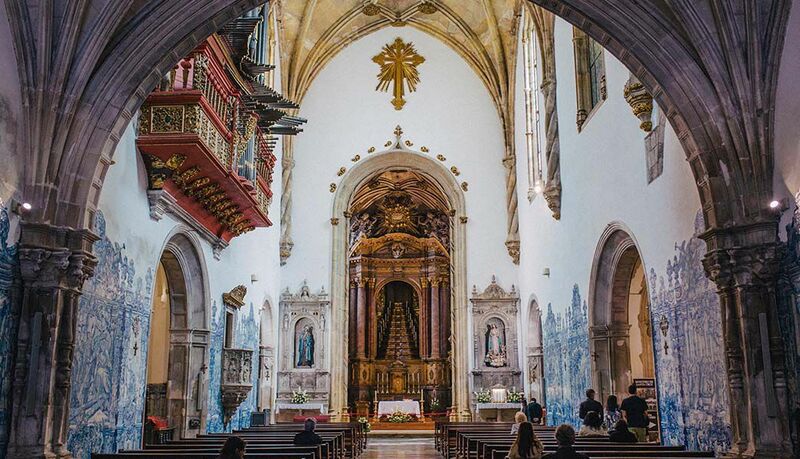 Writer and adventurist Tim Moore travels from Porto to Lisbon by train, relinquishing the itinerary and taking advice from strangers to find the spirit of travel is alive and well in Portugal. 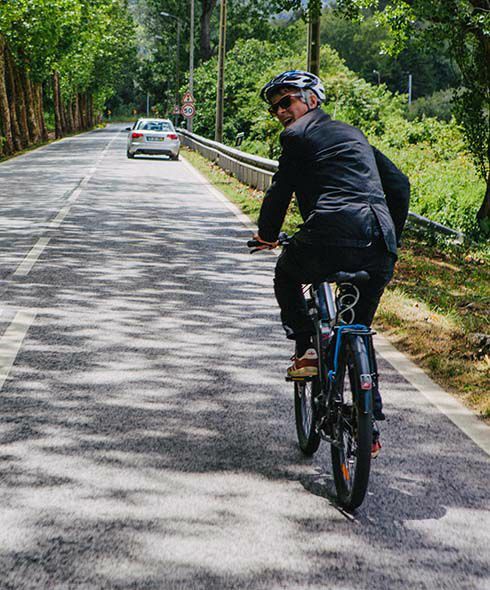 He cruises the Douro valley, masters an electric bike in Sintra National Park and stumbles on the house his father lived in as a boy. Unfortunately, it rained. Travel writer Tim Moore has walked 500 miles across Spain with only a donkey for company, sort-of conquered the Tour de France on a diet of ProPlus and rosé wine, and ridden the 3,200km route of the notorious 1914 Giro d’Italia, handicapped by a century-old, wooden-wheeled bicycle and an unbelievably daft period outfit. For his most recent book, he undertook a cycling odyssey more ambitious – and more silly – than both of those combined, riding 8,500km from the Arctic to the Black Sea on an East German shopping bike. Somehow, he still lives in London. 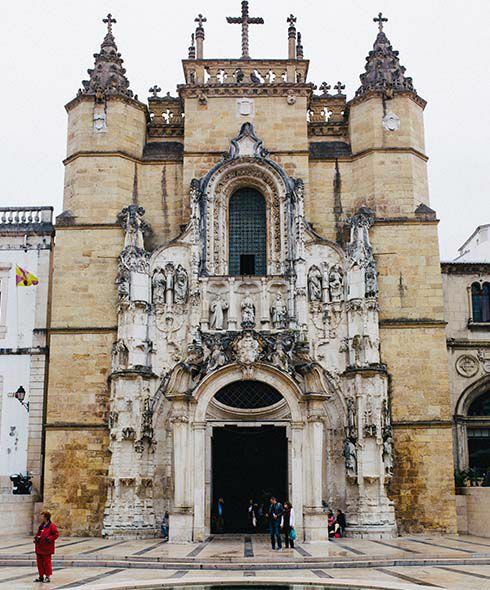 North of the Algarve’s generic beaches and golf greens lies a very different Portugal, where steep, old cities tumble down to majestic rivers, the skyline and landscape still largely shaped by a legacy of Moorish rule and pioneering maritime adventure. Despite its excitable weather, this flank of the Iberian peninsula is a far more peaceful, ruminative realm than its Mediterranean counterpart. Pedestrians amble, and motorists display a regionally atypical aversion to the horn. Even the native language seems laidback, a meandering slur with none of that frenetic Spanish staccato. And so, I’m going with the Portuguese flow, taking the slow train south from Porto, mouth of the mighty Douro, down to Lisbon, where the even mightier Tagus empties into the ocean. And instead of following an itinerary, I’m following my nose, the advice of people I meet along the way and some vaguely waved local digits. Despite its excitable weather, this flank of the Iberian peninsula is a far more peaceful, ruminative realm than its Mediterranean counterpart. 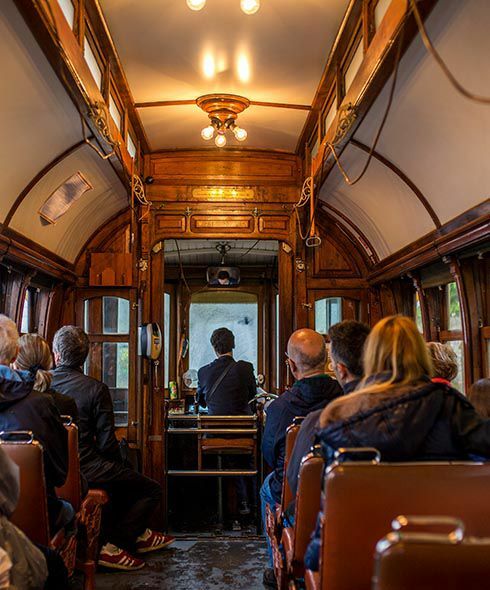 Complying with Raquel’s instruction finds me on the slowest of slow trains: a rattly, clanging, century-old tramcar, all dim bulbs and dark varnish. 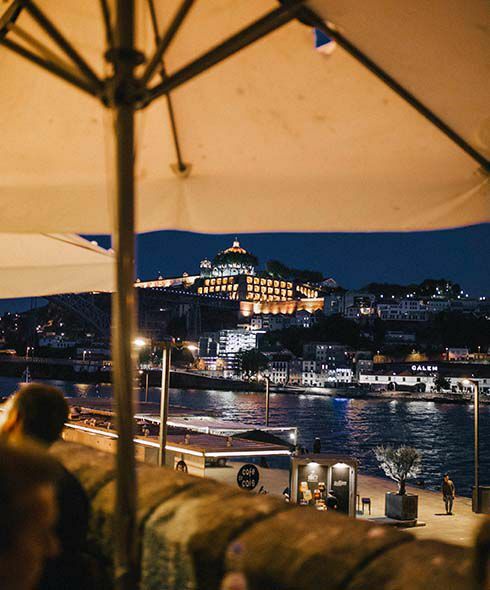 The latest aquatic chapter in Porto’s tale is trickling down the windows; through them I make out the hallowed port cellars that line the Douro estuary, and the terrifying bridges that periodically leap high over it. The tram stops and happily so does the rain. There is only one reason Raquel has directed me to the dockside suburb of Matosinhos, and it is wafting deliciously up the full length of Rua Heróis de França: freshly landed fish and seafood plonked onto the open charcoal grills that front an endless parade of restaurants. Dom Peixe – Sir Fish – wins me over with its name, and in due course with a griddle-charred mountain of squid. Afterwards, I extract my soggy map and ask the sombre waiter to recommend a place for a downtown digestif. He does me proud. An hour later, I’m savouring a delicate glass of house port at the Café Majestic, a chandelier-lit pocket palace that pays tribute to Porto’s belle epoque. Sao Bento, agleam in the morning sun, may well be the world’s prettiest railway station. 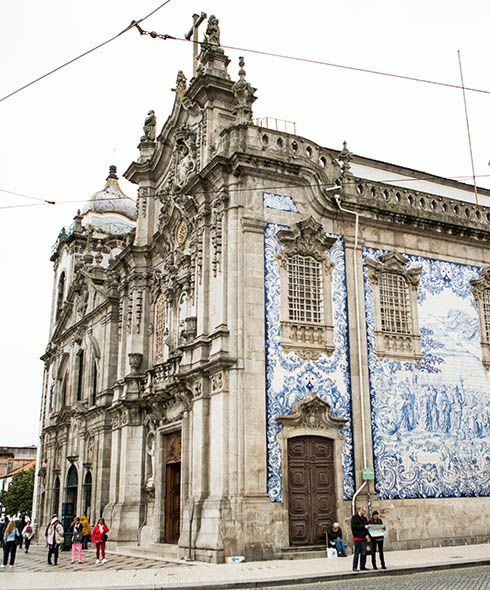 The Moors introduced glazed tiling to Portugal, but local artists refined the technique over the centuries to glorious effect. The station’s concourse is walled from floor to lofty ceiling with gleaming blue-and-white historical tableaux, a perfect introduction to the more humble but no less enchanting tiled panels that grace almost every sleepy station I will trundle through in the coming days. But this ride, hugging the Douro inland to Pinhão, has an awful lot more going on outside those dusty windows. 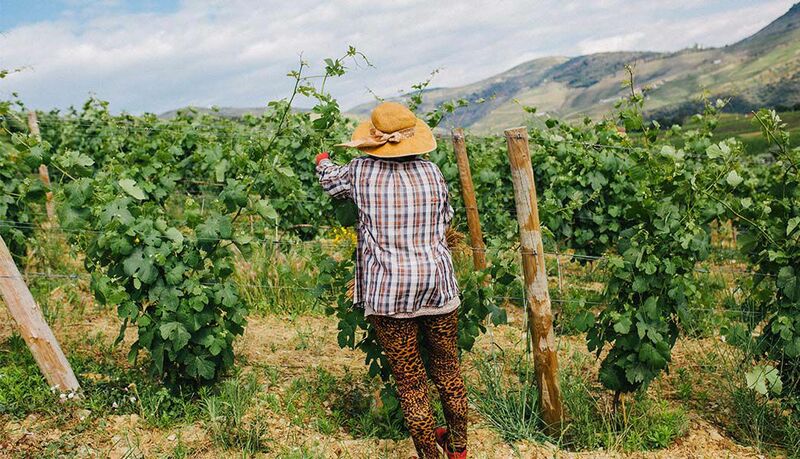 Below us the fat, green river winds through walls of rock and endless stripes of terraced vineyards and orange groves, curled about the steep hills like 3D contour lines. Even the elderly local regulars, bent over knitting and newspapers, raise their heads to savour a Portillo-grade spectacle. The Moors introduced glazed tiling to Portugal, but local artists refined the technique over the centuries to glorious effect. Pinhão is wonderful: a sleepy, timeless rank of whitewash and terracotta laid around a broad curve in the river. I have to walk across the tracks to exit the station, past aproned old dears toting wicker baskets filled with paper-twisted rebuçadas, a local barley sugar. 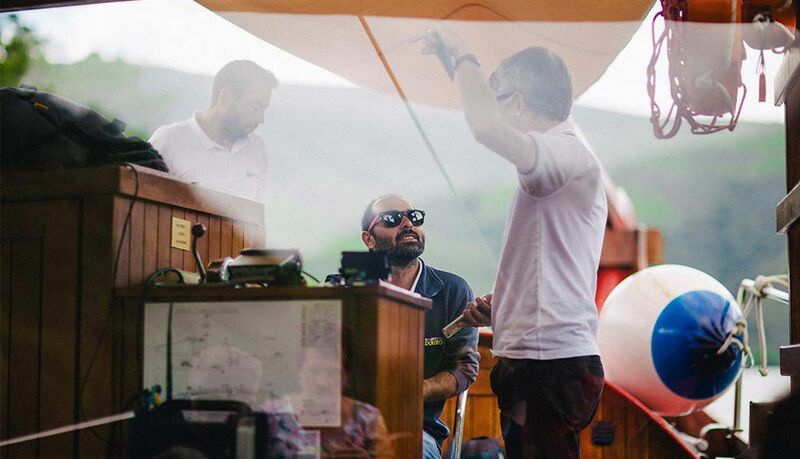 A short cruise up and down the spangled Douro brings me into conversation with skipper Pedro, who tilts his chin at a clutch of roofs atop the vineyards that rear up behind Pinhão. ‘My village,’ he sighs, one hand on the wheel and the other round a thimble of port. ‘We have the best view in the world.’ Pedro tells me it’s an easy 25-minute walk up there, but when I go to leave my trolley case with another Pedro, barman at the Café Imperia opposite the station, he smiles and shakes his head. ‘People up in Casal de Loivos always tell the same. It’s one hour minimum and like this!’ The old men nursing fish-bowl glasses of white wine along the bar turn to watch Other Pedro angle his forearm straight up at the ceiling. At his suggestion I take a taxi up the flailing switchbacks to Quinta do Jalloto, one of the many panoramic wineries perched along the ridges around Casal de Loivos. The vista, admired with a glass of their 2013 Grande Reserva, is glorious. 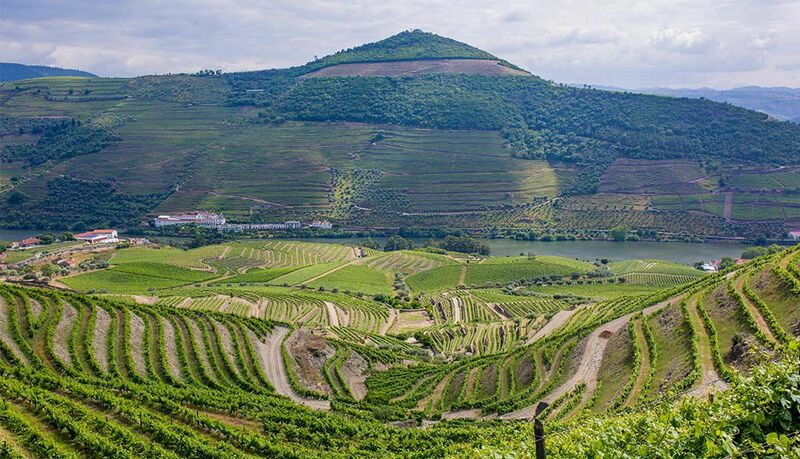 Those steepling terraces beneath are graced with giant placards proclaiming allegiance to venerable port houses – DOW’S, CROFT – but with the ageing port market on the wane, most Douro grapes are now magicked into ever-more sophisticated red wines. Full appreciation makes a wayward stumble of my vertiginous walk down through the broiled vineyards. Back at Porto I’m met by Eduardo Moura e Sá, and whisked off to a Douro-side steak dinner. He’s a splendidly patrician industrialist who speaks with urbane fondness of the fabled ‘oldest alliance’ that links Britain and Portugal, referencing a shared heritage of port appreciation, and pointing out the redolent scarlet pillar boxes and telephone kiosks that stand amongst twinkly streetlamps along the quay below us. 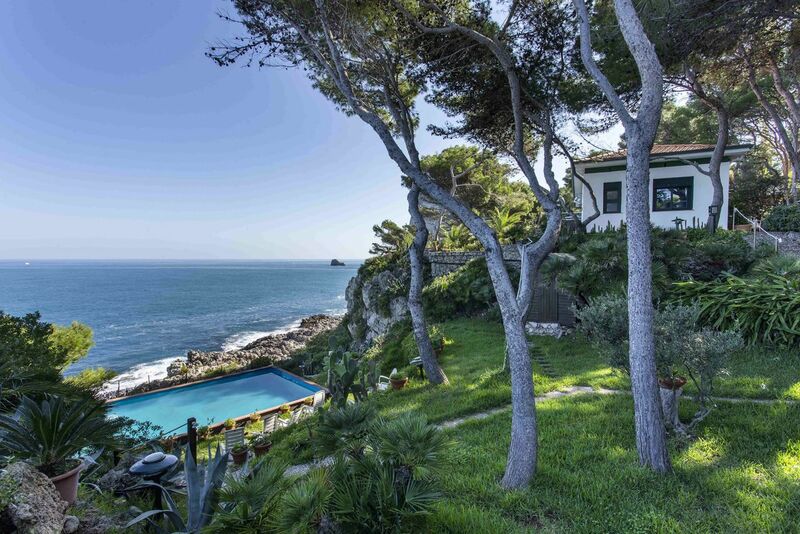 Then it’s a short and balmy drive south to the quinta that has accommodated his family for umpteen generations, now doubling as a grand but homely guest house. My room has a magnificent carved bedhead, heavy shutters and an heirloom sideboard full of tassled perfume puffers. It’s like staying with the loaded, posh grandparents you never had. 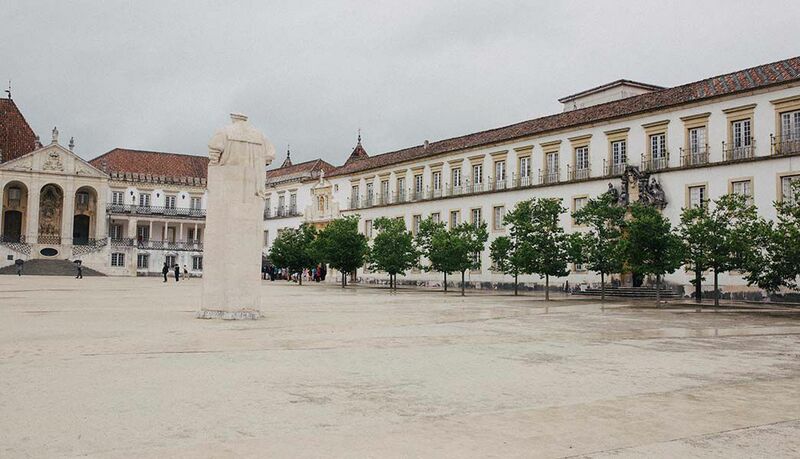 Coimbra, a pootling train-ride south, was Portugal’s first capital and remains home to one of the world’s oldest universities. 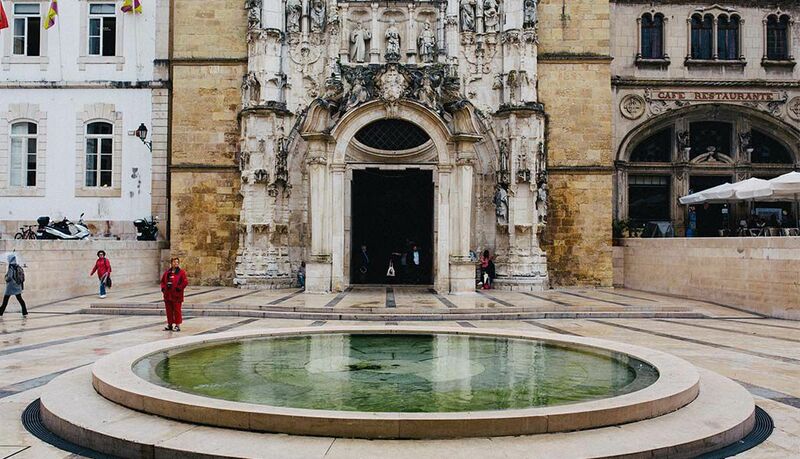 Yet it’s slightly off the tourist radar, and the waitress who brings me my caldo verde – a leafy soup with chunks of spicy chouriço – can manage no more than a charming shrug when I request sightseeing suggestions in English. Returning with coffee, she shyly draws a small circle on my map with her biro. My room has a magnificent carved bedhead, heavy shutters and an heirloom sideboard full of tassled perfume puffers. It’s like staying with the loaded, posh grandparents you never had. 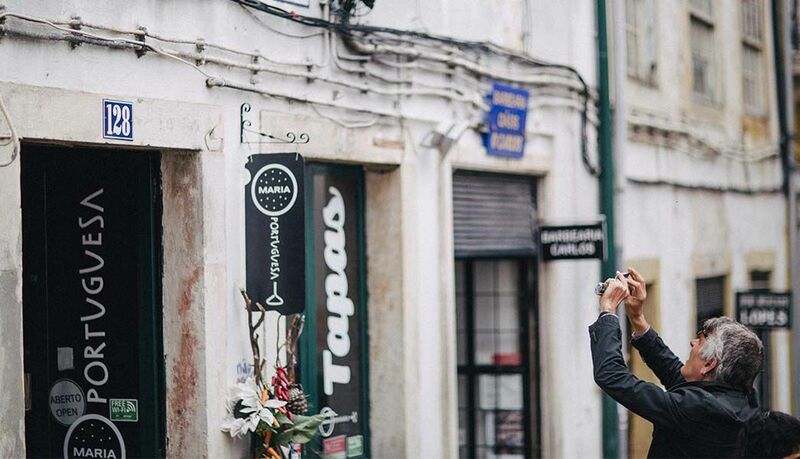 The city’s old town is a maze of perpendicular alleys that echo with the screech of vehicles struggling for traction on slick calçada, the patterned black and white cobbles that are such a pleasing urban fixture in this part of the world. Shrubs sprout from the roofs of weathered Romanesque churches, and roses tumble down ancient walls. My map-circle reveals itself as a delightful shabby-chic botanical garden, testament to the plucky 15th-century seafarers who returned from the tropics with exotic plants that have thrived in Portugal’s temperate climate. Deserted avenues of spindly palms radiate from overgrown fountains and rusty Victorian glasshouses, flanked by gaudy purple-orange blurts of bird of paradise. Then it’s a hike back up and over the lofty old town to the station, window shopping along the way. 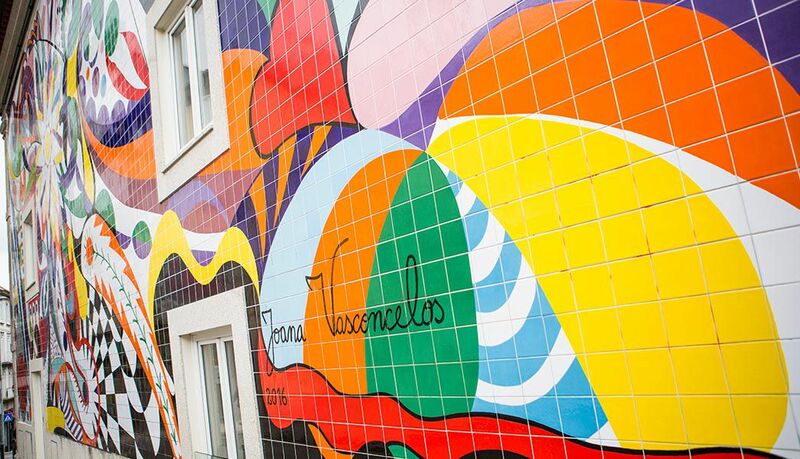 High streets might be dying elsewhere, but not in Portugal. The shops are all tiny, and rewardingly niche: flat caps, model cars, ecclesiastical regalia. 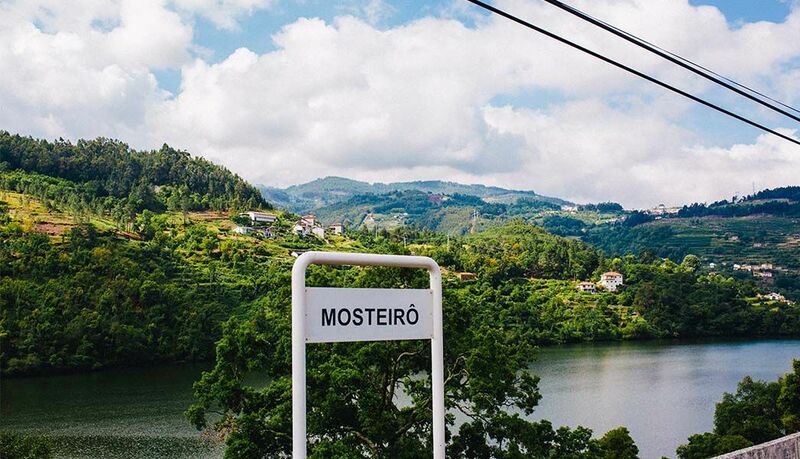 A languid, two-hour rattle on the self-styled ‘high-speed express’ takes me through misty flatlands to Caldas da Rainha, where I’m met on another ghostly platform by Patrick and Hayat. 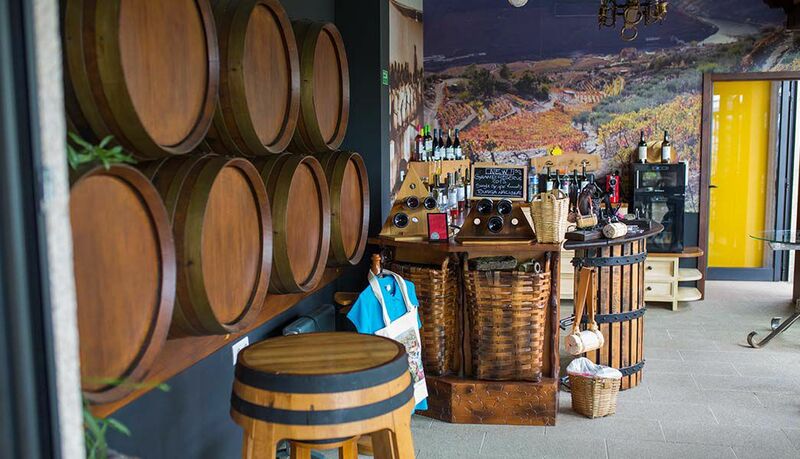 Over an artful plate of polvo à lagareiro – baked octopus with smashed spuds – the Belgian couple tell me what drew them to this overlooked stretch of the Estremadura coast: empty beaches, wild seas, a general air of mystery. ‘There’s a Visigoth chapel in the dunes nearby,’ says Patrick. ‘It’s one of the oldest churches in Europe, but hardly anyone knows about it.’ Their guest house is tucked up near a sweet little church just inland from those mighty Atlantic gusts, and I bag the prime room: my very own windmill, a cosily converted cousin of the sturdy sawn-off cones that dot the surrounding hilltops. I hit Peak Trundle on the train south to Sintra, sharing a creaky carriage with a nun and a bloke with a bundle of massive planks he clearly couldn’t fit in his car. Storks totter about in poppy-speckled fields. Goods trains stacked with eucalyptus trunks lumber past. A Bernard Cribbins station master waters his window-boxes beneath a steam-age water tower. The 20th century reappears when we ease past outer Sintra’s low-rise blocks, shortly followed by the 21st. I’ve never ridden an electric bike, and Miguel talks me through the basics in the Sintra station car park. ‘Turbo mode’ sounds deeply alluring, but Miguel’s recommended itinerary turns out better suited to reverse thrust. After a mad 20-minute plunge down the foothills of the Sintra Mountains, I skid to a halt with my front wheel on the sand at Praia das Maçãs. It’s a pilgrimage, of sorts. My father’s family lived in Sintra during the early years of the war, and my grandfather – the Telegraph’s Lisbon correspondent and a reckless naturist – posed for a fabled album shot on this bright and blowy beach, standing before the dark cliffs wearing nothing but a proud smile and his gold-rimmed pebble specs. In preference to a homage, I toast him with a chilled Super Bock at one of the bars that gaze out at the boisterous Atlantic. 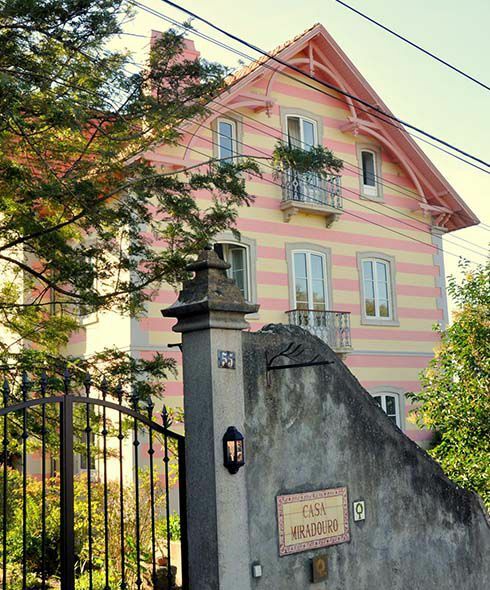 Turbo mode whisks me easily back up to town and Casa Miradouro, a candy-striped holiday mansion dating from Sintra’s 19th-century aristocratic heyday. My attic balcony offers beckoning views of the Moorish castle that looks down on the town, its Game of Thrones battlements meandering around a granite outcrop. Next morning, plotting my ascent, I bump into Miguel near the centrepiece Town Palace, a weird white Moorish fantasy topped with chimneys like giant upturned megaphones. He tells me that the Villa Sassetti, halfway up the castle hill, has recently opened a public footpath through its well-tended grounds. ‘It’s beautiful,’ he says, ‘but you will wish for turbo mode in your feet.’ He is right on both counts. My annual FitBIt record will be shattered come sundown. From the windy castle turrets I don’t look down on the majesty of Portugal, but of its far-flung empire. Beneath me sprawls a kind of pioneering theme park, shaped by colonial wealth and influences. Pastiche, pimped-up chalets and chateaus stand amongst day-glo fronds of bougainvillea, huge sequoias, date palms, tree ferns and delicate Oriental pines. Taking a different path back down to town, I miraculously blunder across my father’s childhood home; he’d only remembered the name of the house, not its location, but suddenly there it is on a whitewashed wall just past the church of Santa Maria, inevitably painted in blue on white tiles: Casa da Lapa. I gaze up and down the winsome cobbles and across the palace-dotted hillsides and suddenly feel rather shortchanged by those formative years in Ealing. Though at least my dad kept his shorts on in the garden. The lazy vibe I’ve been tuned into gets lost in the chatter of a thousand commuters on the short ride to Lisbon. But there’s an infectious spring in the capital’s step: inching through the traffic to my dockside hotel, the cab driver says half the roads have just been closed for the start of the month-long Festival of St Anthony. And so my slow days end with a fast night out on the black-and-white tiles. 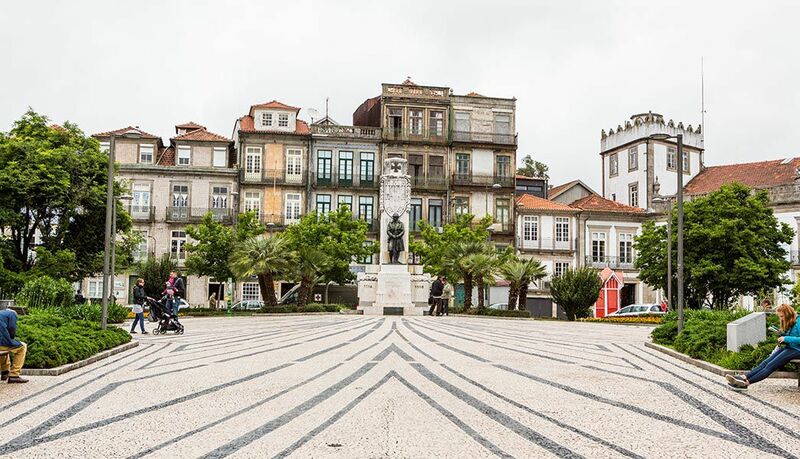 A warm breeze funnels laughter and conflicting tunes through the monumental Rua Augusta arch and out across the yawning riverside squares. There are troupes of drummers under floodlit jacarandas and a few too many €1 plastic tumblers of wine. And on the long march back to the hotel, I get lost and reprise this trip’s defining pleasure: leaning back on my heels down steep, cobbled alleys, gazing up at the stars through tram wires and palm leaves. 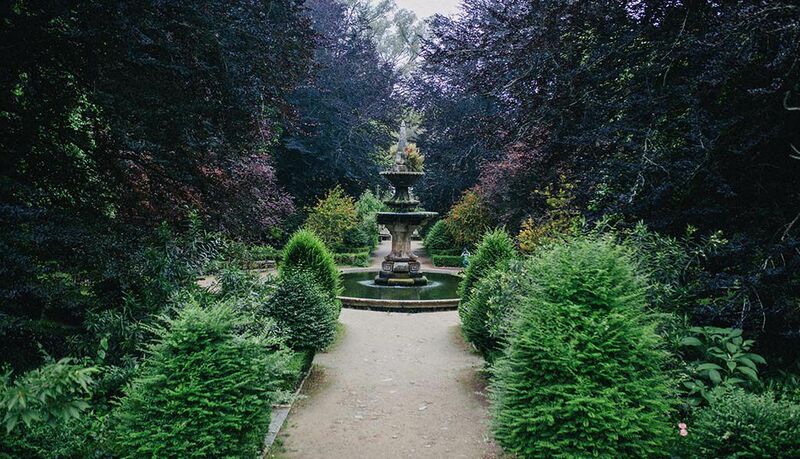 Tim flew into Porto and spent night one at Torel Avantgarde. 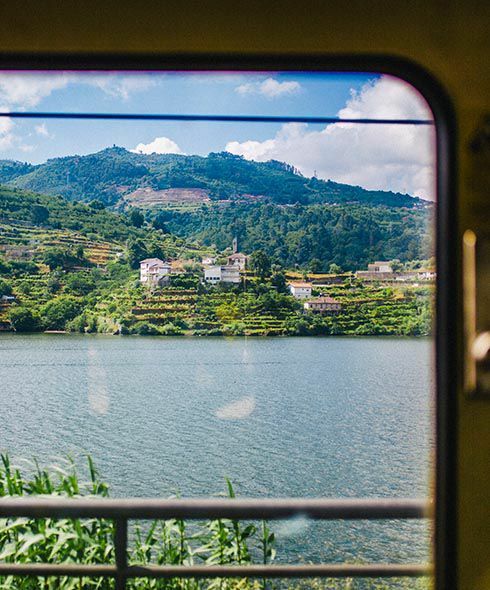 From Porto, he travelled by train to Pinhão (approx 2h45m) in the Douro Valley. 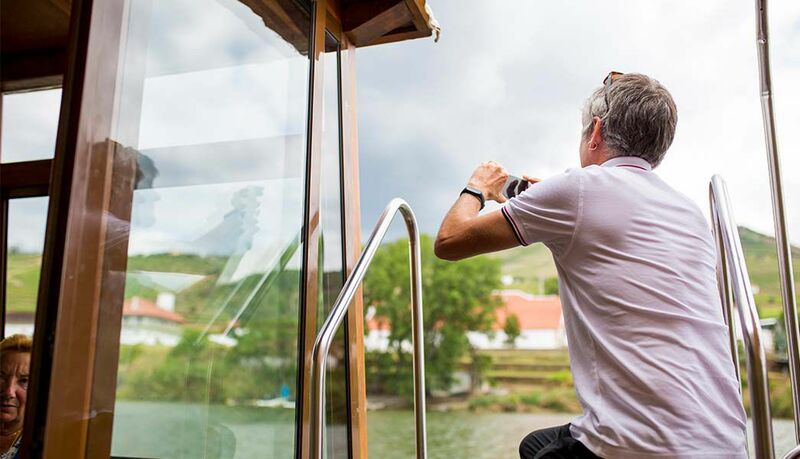 The Douro Valley boat trips leave each hour and are a few minutes walk from the train station. He stayed at Quinta de Mouraes. From Caldas da Rainha Tim rode to Sintra (approx 3h) and hired an electric bike from Wolf Rentals at Sintra station car park to explore the area. He stayed at Casa Miradouro. 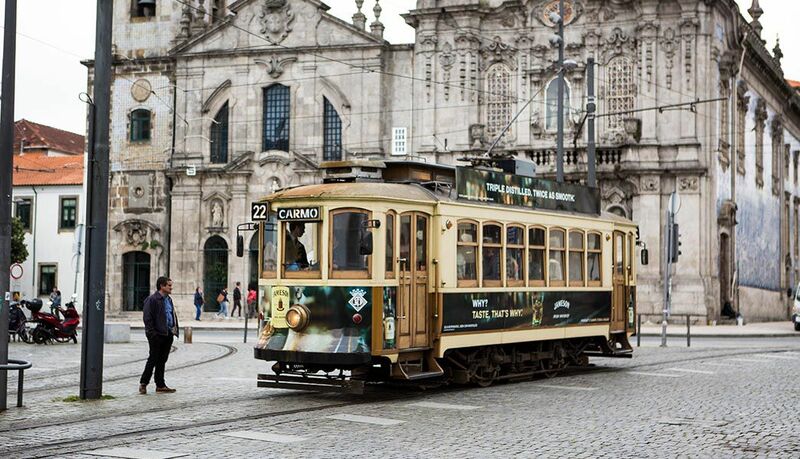 Finally, his last train journey was the 30m Sintra to Lisbon route and a stay at As Janelas Verdes before flying home.